Per Motorsport.com, Mercedes Formula One boss Toto Wolff wants to get into contract talks as soon as possible to keep both Lewis Hamilton as well as Nico Rosberg on the team for the forseeable future. This would shut the door on a Fernando Alonso to Mercedes move as well for Hamilton going back to McLaren. Nico Rosberg's contract was extended earlier this year, which made sense as Rosberg has proven himself to be an invaluable part of the team. Hamilton's, however, hasn't been extended yet. It's set to expire at the end of 2015. Sure, that means next year is taken care of. This begs the question, though: what if the lack of a contract extension plus the intra-team rivalry with Rosberg means that Hamilton won't feel valued enough at Mercedes? He could very well pull an Alonso and look elsewhere. It's all coming down to the wire for Mercedes in the drivers' championship. Hamilton is just ahead of Rosberg in the points and is the most likely driver on the team to bring that title home at the double-points race at Abu Dhabi. We didn't want to be in a situation where in a year's time there is the possibility we have to be filling not one but two places. Nico is an important part of the team, he fits in well and his performance is good so we wanted to extend at an early stage. With Lewis, the contract runs for another year anyway and in the summer we started to discuss (extending) it (beyond 2015). We have agreed that we want to continue and Lewis has said the same but at some point we decided that it was not the right time to do it. The duel was so intense so we thought it was a good idea to talk after Abu Dhabi. Now we have agreed that we get together on Monday in Abu Dhabi to talk about it. 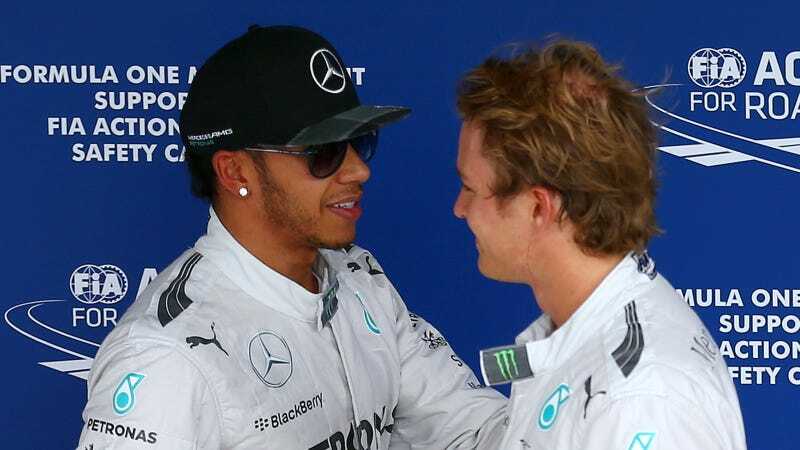 The drama between the two drivers has been no secret throughout the season, with Rosberg and Hamilton colliding in numerous ways both on and off the track. "The only thing the two are interested in is that they have the fastest race car possible. So I would say at the moment that we have a good situation," explained Wolff. Yes, yes: faster than your teammate's, too. That makes for some phenomenal balls-to-the-wall racing. Mercedes, though, is happy with the situation. Mathematically, the numbers are on Lewis' side, but we want to behave neutrally. Lewis is in the lead and a second place will be enough to be world champion, so Nico has to hope for a third place or worse (for Hamilton). If you look on the basis of the last few races, then everything points to another one-two. I guess we'll have to tune in at Abu Dhabi to find out who wins the season, and we'll know sooner or later if the talks were a success. *Wolff is Austrian, but we're rolling with this joke because of where Mercedes is based. Numbers! Stats! Serious business.